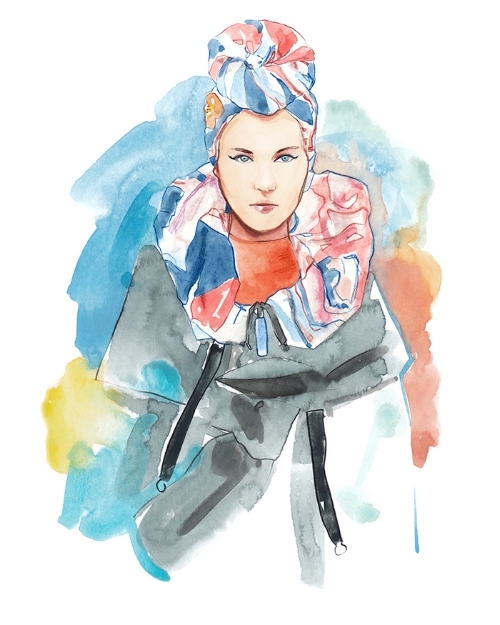 We love the Paris Fashion Week SS18 drawings by Fashion illustrator Francesco Lo Iacono. This month he will start tutoring a monthly Fashion Life Drawing class in London. Hi Francesco! Great to have you here. First can you tell us something about the Paris Fashion Week SS18 shows? SS18 was really an amazing season! I am really in love with what Jonathan Anderson did at Loewe, it is exciting to see what he's doing to this brand season by season. I also love the debut collection of Natacha Ramsay-Levy for Chloé, really a stunning beginning. Jacquemus stole my heart once again, it is really refreshing for the Paris fashion scene. I am an Italian ilustrator currently living in London. Before that, I lived in Paris for about five years, where I also worked for a trend forecasting agency. As an illustrator I have worked for different fashion magazines, web-sites and young designers. 2. How did you get started as an illustrator? Little by little, though it felt quite natural. I first started getting interested in fashion photography, at that time I was about to end my two years master in photography. But I have been into drawing since I was a child, so at some point fashion illustration became the perfect and natural mix of my interests. I think my style is quite delicate, romantic in a way and timeless maybe. I’m usually caught by a certain look, outfit, designer, color or style. It can be a picture from a magazine or a fashion show or a picture I took myself. Once I chose what to draw my artistic process is quite quick, also because with watercolor you often need to go fast sometimes. I later scan my illustration and clean it if necessary on Photoshop. It really can be anything. Street style, fashion shows, music videos, art exhibitions, but above all I guess fashion magazines editorials constantly inspire me. I buy tons of magazines each month. Vivienne Westwood has been my favourite designer since I was a teenager. That would be a dream to work for her. I also love J.W. Anderson a lot. 7. What is your favorite thing in the world to illustrate? I don't think it's always the same. But I love to draw intricated prints. Or flower prints. I like accessories. Especially those who enhance a face. 8. What’s your dream project? I really would love to create a book with my own illustrations, it's something I've been thinking about a lot lately. 9. What 3 things can't you live without? "Keep practising, all the time. Be kind and polite. And don't be afraid to ask"